Whatever utilities the process needs, the process gets. 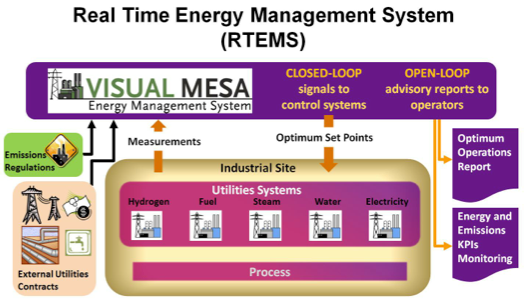 A Utilities Real Time Optimizer such as Visual MESA ensures that Operations is doing the best it can with the utilities assets available at that moment and within the current operating conditions. 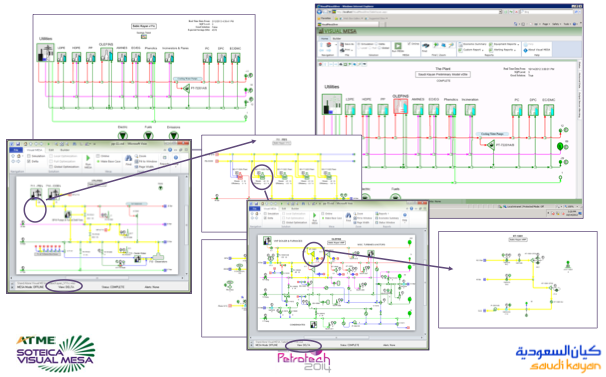 It provides Operations a Real Time Target for operating the utilities at the minimum Site-Wide overall Utilities cost. Data validation for all individual meters, including what happens to the model when a certain individual meter goes bad. Saudi Kayan Petrochemical Company is one of the largest petrochemical complexes in the world, located in Jubail Industrial City, Kingdom of Saudi Arabia. A real time online utilities model was implemented to help with the energy cost minimization and energy management for the Petrochemical Complex. The real time, online, energy management system allows identifying the different economic trade-offs that challenges the production and internal distribution of the energy at minimum cost. A detailed non-linear rigorous model of the steam, fuels, power, boiler feed water and condensates systems has been built, including all the interactions between these systems, constraints and degrees of freedom for their operation. The same model used for the online, real time optimization, is also used in stand-alone mode, populated either with current or historical data, to perform case studies for planning or evaluating alternatives for a better operation of the energy system. As a result of the project, the information of the Saudi Kayan Petrochemical Complex energy system has been organized into one real time model and a single environment to which everyone has access through a web browser. Steam let-downs, vents and condensing will change automatically, manipulated by the control system, as a consequence of the actions performed over the optimization handles. The total Real Time Online Energy Management System benefits have been around 3.42 MM$/year. 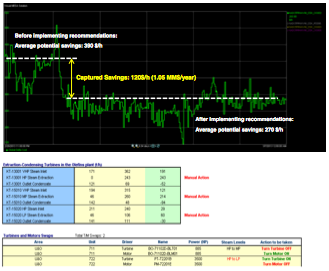 An example will be presented in which Visual MESA recommendations were partially applied and, as consequence, 1.05 MM $/year of savings where achieved. Around 3:00 AM on March 2nd, operators started increasing the MP steam extraction on KT-15010 turbine located at the Olefins plant. This was only one of the calculated optimization actions. 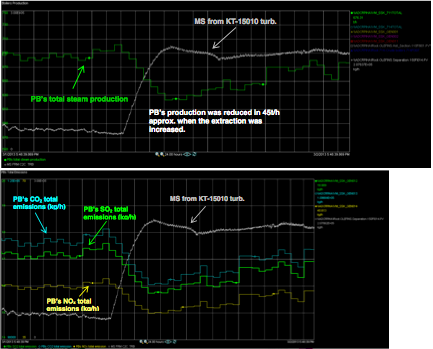 RTEMS continuously calculates Key Performance Indicators (KPIs) such as boiler and heater efficiencies, plant energy consumptions, steam imbalances, etc. on a validated and consistent basis. 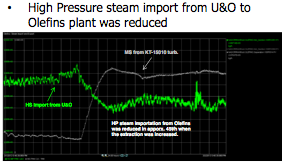 RTEMS acts as the "Steam Vent and Letdown Police". Everybody will know that Visual MESA is looking at the Site- wide situation 24x7x365. It is continuously helping reduce cost. And taking into account the site-wide emission constraints. Visual MESA based Real Time Energy Management System was successfully implemented at Saudi Kayan Petrochemical Complex, helping to achieve energy cost savings. The same model used for the online, real time optimization, can also used in stand-alone mode, populated either with current or historical data, to perform case studies for planning or to evaluate alternatives for a better operation of the energy system.